PORT-AU-PRINCE, Haiti - Haiti's leader and several thousand women who are part of a cash transfer program, set up by the Caribbean country's government to assist vulnerable mothers, marked during the weekend the two-year anniversary of that particular component of the current administration's social assistance program. President Michel Martelly said his administration is aware of the fact that the social assistance -- such as the cash transfer program called Ti Manman Cheri (Dear Little Mother), which has been made available to many poor women and other underprivileged individuals in vulnerable areas -- was only a relief. "Ti Manman Cheri is only a show of solidarity to help you hold on, but what will change the situation is that your children should to be raised in a different manner so that they may become engineers, doctors...," Martelly told an enthusiastic crowd on Friday. "What you need is jobs in order to have the means to meet your needs in terms of your wellbeing without having to rely on any particular assistance from a president or anybody else," said Martelly. "That's why we are setting up the necessary framework to attract investments and grow the economy," Martelly told HCNN on the sidelines of the gathering held on a large open field. More than 100,000 vulnerable mothers in poor areas have benefited from the Ti Manman Cheri program, while the broader national social assistance program (EDE PEP), which has more than a dozen components, has already reached several million beneficiaries around the country. "We are building a state that will provide services to the population. We want to change living conditions from what we are trying to put in the head of your children, the new generation, in terms of knowledge, training and education," said Martelly. 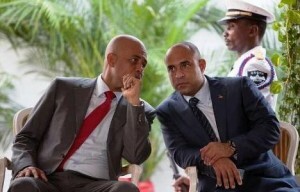 Responding to people's concern about the continuity of such social programs after the end of his term in office, Martelly called on the population to make sure they make the right choices during the upcoming legislative elections later this year and during the next presidential ballot at the end of 2015. According to the Haitian constitution, Martelly is barred from seeking a second consecutive term, but he may support a close ally who would be guaranteed to continue projects and programs his administration has initiated. Prime Minister Laurent Lamothe recently launched a new action plan to reduce poverty in the country, which will cost nearly $800 million over the next three years. "You imagine a country like Haiti where you have so many poor people, and there had never been a social assistance program to help those people," said Lamothe. "I believe we owe this kind of solidarity to the most vulnerable while we work to improve living conditions in a more sustainable way," he added. The program is very appreciated by the beneficiaries, while more people in the poor neighbourhoods expect the government to bring the program to their communities. Government officials have acknowledged the need to assist more people living in deprivation, but invoked a lack of financial means. "I am 60 years old and it is for the first time any government has given me anything," Marcia Florenvil told HCNN as she attended the gathering on Friday.